Someday maybe I'll do a hair post that isn't even slightly gross. This isn't that day. If you're sensitive, you might wanna skip this one entirely. 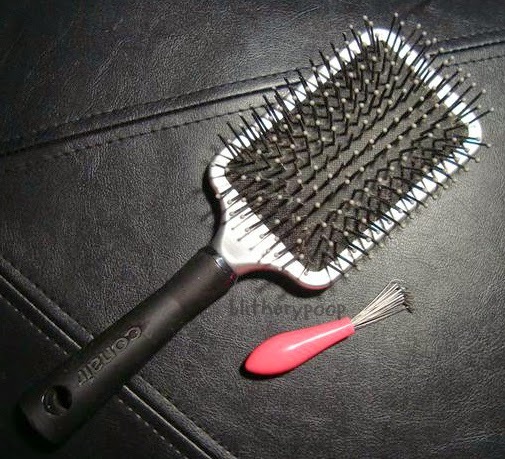 If you're not and you've ever been skeeved by your own hairbrush, read on! 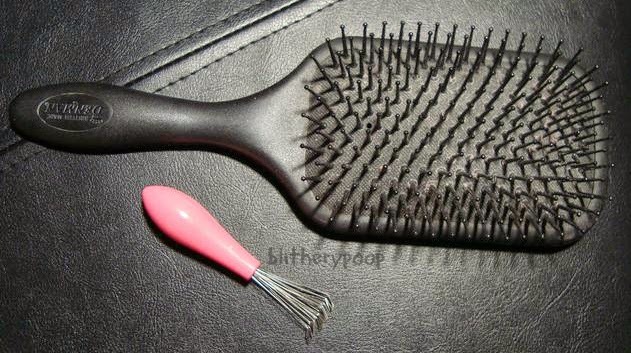 When your hair is a few feet long, your hairbrush fills up with shed hair quickly. I have to clean mine pretty often, but I never felt like I got it really clean. I know I'm not the only one who gets this weird buildup of lint at the bases of the pins. Back before I cared about my nails, I'd pick it out by hand, then wash my hands and the brush. 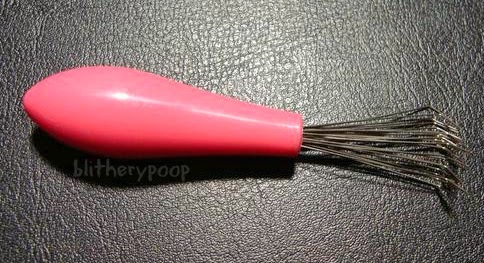 Now I try not to use my nails as tools, so my brush has become a linty disaster. When I wash it, all I get is wet lint. 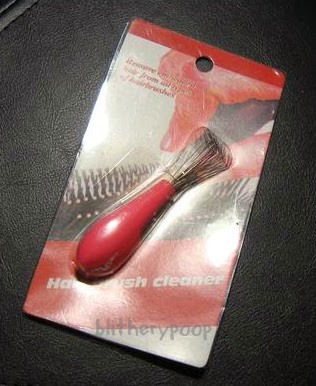 I got fed up one day and googled "hairbrush cleaner". Chinese sellers on eBay have dozens of listings for exactly that, so I ordered one. One dollar and few weeks later, here it is! Figures they'd send me a pink one. Harrumph. Nichole had a good laugh about that when I told her. It's a weird little thing too, for as simple as it is. 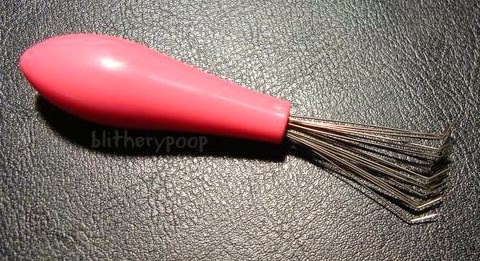 The plastic handle holds a bunch of little wires that are bent slightly toward the ends. You can see it a little better from the back of the tool. It came in some of the least attractive packaging I've ever seen. I had to show it to The Beard, it's that ugly. "Why'd they get a burn victim to model it?" For $1 and free shipping though, who cares how the package looks? 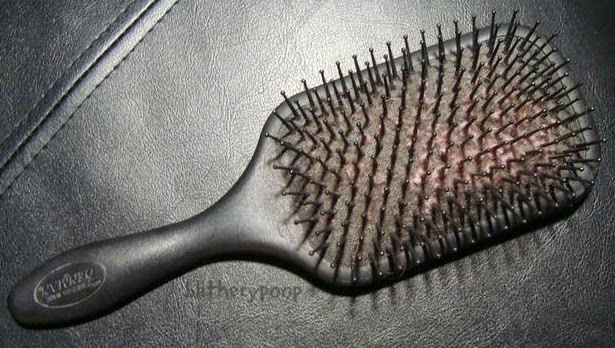 Remember how I said my brush looked gross? Look at all of that lint! There wasn't a ton of hair in it, since I don't let that build up too much, but the lint. THE LINT! It took a few minutes of fiddling between and around the pins with the cleaner, but the results were impressive! I love this brush, by the way. Denman D83 Large Paddle Brush. Not perfect, but I did still need to wash it. I decided to pose a real challenge for this gizmo. I went into The Beard's room and grabbed his brush. Brace yourself...this is nasty. Say it with me "ewwwww!" His hair is long and he uses the brush on his beard too...and he almost never cleans it. This was a true test! It took longer than mine had, but I think the results are stunning. Once they were washed, they looked even better. A dollar well-spent! 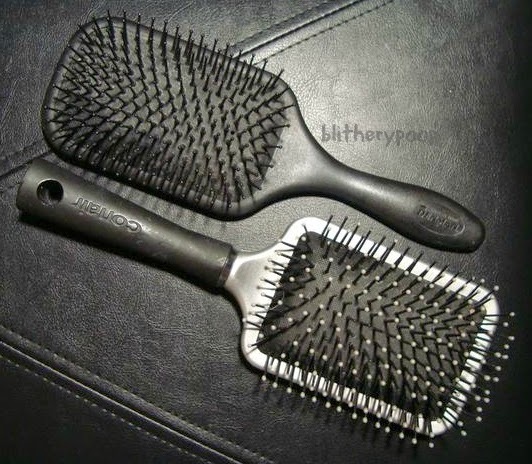 All you do is rake it around and use it to pick at the lint and everything just comes off. Awesome! I'd call this thingy a must-have. lol There's a weird satisfaction to it, I'll admit. The Beard's brush was so gross! If that sells out or ends before you see it, there are a bunch of them by other sellers for around the same price.